Meet twelve year old Alifonsino from rural Petauke in Eastern Zambia. At age ten, Alifonsino dropped out of school due to limited support from her family. And now, Alifonsino has even more concerns on her mind. Many of her older peers in her village were married off at an early age and she worries that it might happen to her too. Alifonsino’s fear is all too common. 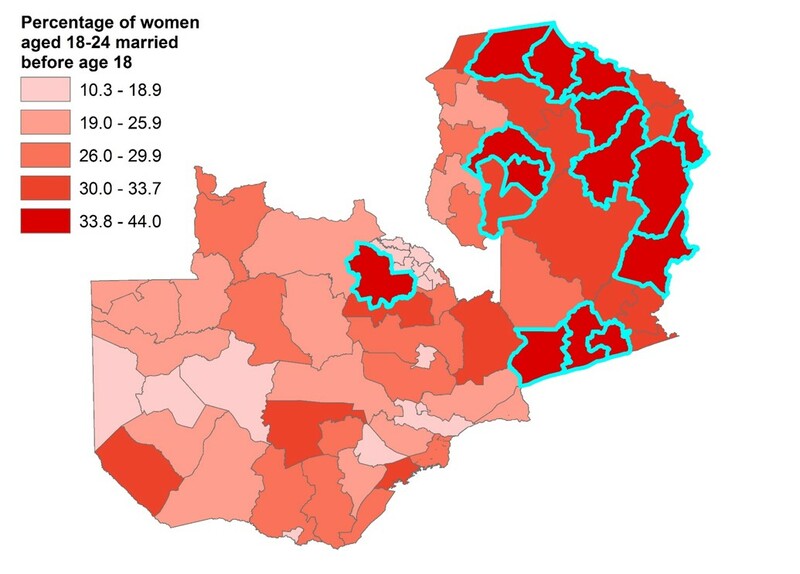 In Zambia, an estimated 31% of girls are married before their 18th birthday, making Zambia one of the countries with the highest rates of child marriage globally. Girls living in poor rural areas are most likely to be married young. Economic hardship, lack of education, early pregnancy and the burden and low value of girls in society drive this harmful practice. Life changed for the better when Alifonsino began attending a girls’ safe space, run by the Young Womens’ Christian Association of Zambia (YWCA) with technical and financial support from the UK Department for International Development (DFID) and the United Nations Population Fund (UNFPA) in Zambia. “Thanks to the weekly lessons we have at the safe space, my parents and I have learnt the value of education. I have now gone back to school [grade one] at Senya primary school. I have also learned that as a girl, I also have a voice in my community. I can speak out when things are wrong, such as when I’m forced to marry before I complete school” says Alifonsino. Implemented as part of UNFPA’s “Action for Adolescent Girls”, the safe spaces have since 2015 reached 5,676 girls like Alifonso in 6 districts of Samfya, Milenge, Katete, Petauke, Solwezi and Mongu. The safe spaces involve a 1-2 hour weekly girls-group meeting with a mentor who provides training on health, leadership and life skills, as well as discusses issues that affect girls including child marriage and adolescent pregnancy, and how they can seek help. They aim to build girls protective assets as well as create an environment where girls can find friendship and support from a group of girls their age. Seventeen-year-old Sena who was forced into marriage when she was fifteen is also enrolled in one of the safe spaces run by YWCA. She indicates: “Before I joined the safe space, it was difficult for me to save money. But now I am better at managing my finances. I feel very good about the group meetings and I don’t miss a single session. If I have any problems or issues I’m able to speak to my mentor and get her advice”. The safe spaces also have a simple rule that boosts its long term impact. Capitalizing on girls’ ability to share knowledge and mobilize others is what makes this approach so powerful. Girls spread the word far beyond the four walls of the safe space. Girls alone cannot bring an end to child marriage. That is where the Government comes in. In 2013, the Government of Zambia launched a country-wide campaign to end child marriage, focused on two angles: empowering traditional leaders to become champions of girls’ rights in their chiefdoms; and changing laws and policies to ensure that girls are legally protected from child marriage. 2016 saw further developments with the Government of Zambia launching a five-year National Strategy with the ambitious goal of ending child marriage by 2030. In 2015, Zambia also co-hosted the African Girls’ Summit on Child Marriage, a demonstration of Governments commitment towards regional initiatives to protect girls’ rights.